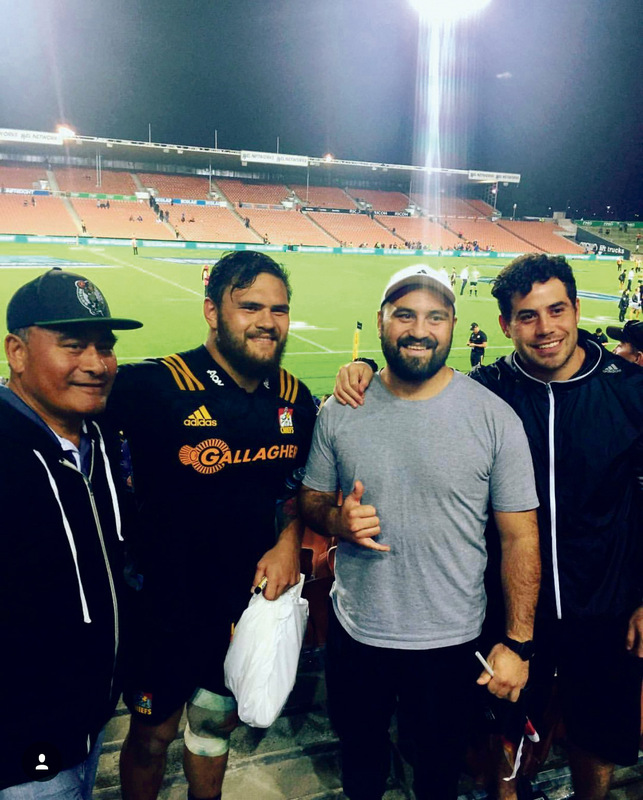 Angus Ta’avao may be on the verge of turning out for the All Blacks but it was more sedentary games he often played in his youth, an old Raglan mate revealed this week. “I hung out with Angus a lot,” Simon Laxon told the Chronicle from Melbourne where he now hangs from ropes with commercial engineering company Absafe. Besides kicking the ball around they played a lot of Nintendo 64 – the classic gaming console – and downed a lot of cake. “We were always taking his mum’s carrot cake, I remember, dabbling in bits of food,” he laughs. That was around the time Angus lived in town with his mother Wendy McGee and brother Stuart. He was a Year 7 pupil at Raglan Area School before boarding at Dilworth in Auckland and returning here for the holidays. Now the 120kg-plus prop, off the back of an unexpected Super Rugby season with the Chiefs and a provincial campaign back with Taranaki, has surprised many with a call-up to join the All Black squad preparing for Saturday’s test in Nelson against Argentina. Even so “he didn’t seem to be the aggressive sort,” says local area school principal Malcolm Cox. Angus was also shy, recalls Chronicle editor Maki Nishiyama, who boarded with the family in Long Street for a time. She remembers Angus as much quieter than Stuart, an observation backed up by the boys’ mother who posted on Facebook last week how he was “mercilessly tormented” at home by his older brother. 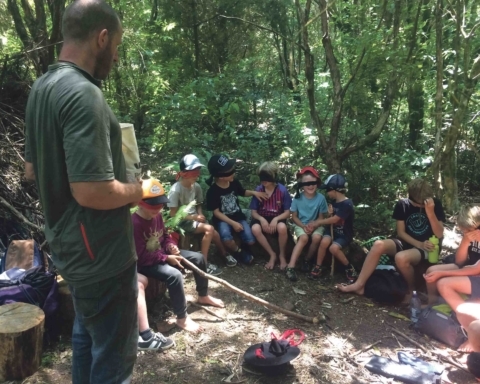 Wendy, who these days lives in Auckland, said in her post that while Angus was big – and she had to carry around his birth certificate to prove his age – he was always told he wasn’t aggressive enough. But after former ABs forwards coach Mike Cron told him to hang in there – that the game would move away from “bash and crash” – Wendy believed her son’s time would come. And now it looks like it has. The 28 year old told Radio Sport Breakfast last week there had always been a big question about his scrummaging “and I feel I have stepped up this year”. In another recent interview – with 1 News – he acknowledged “I’m now playing my best rugby”. ABs coach Steve Hansen spoke in similar vein last week in justifying the tighthead prop’s call-up: “Angus had a big season for the Chiefs during Super Rugby, was part of a very good Chiefs pack and has made big strides on the technical aspects of his position,” he said. 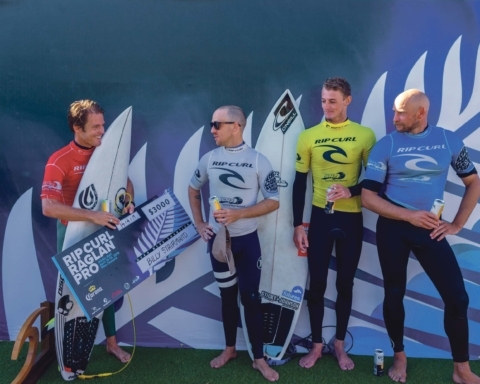 Angus says he’s been inspired by friends and family backing him all the way, including partner Kristyn Bradfield who visited his old haunts with him in Raglan a few months ago. The couple’s baby son Leo has a genetic disorder which earlier brought them back from Australia, where Angus played for the Waratahs, and has prompted them to rule out any further overseas contracts.